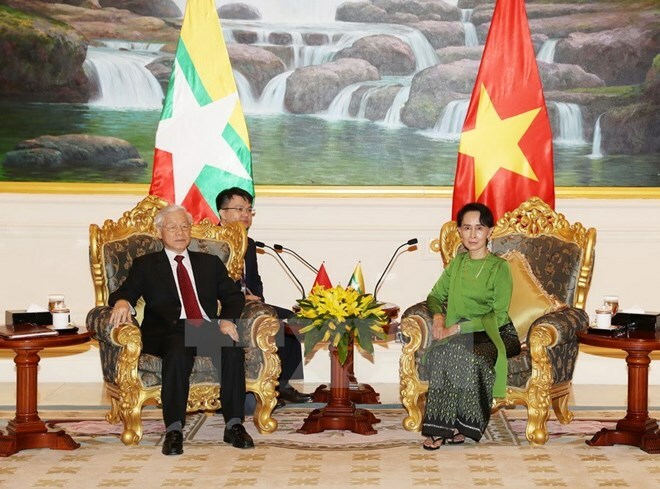 Naypyidaw (VNA) – General Secretary of the Communist Party of Vietnam Nguyen Phu Trong and Myanmar State Counsellor Aung San Suu Kyi exchanged major orientations to boost cooperation between the two countries in the time ahead during their meeting in Naypyidaw on August 25. The two sides highly valued the official establishment of the Vietnam-Myanmar comprehensive cooperative partnership framework, creating a new milestone and momentum for the bilateral collaboration across the fields. Aung San Suu Kyi affirmed Myanmar and Vietnam are reliable friends and her country wants to continue accompanying Vietnam and learn from its experience, while Party leader Nguyen Phu Trong said Vietnam always considers Myanmar a priority in its external affairs policies. They agreed to increase delegation exchanges at all level in all channels from the Party, Government and State to the legislature to increase political trust, reinforce friendship and boost comprehensive cooperation. The host and guest concurred to strengthen coordination, exchange information and consultations and provide mutual support at multilateral, regional and international forums to maintain solidarity, unification and promote the central role of ASEAN in the regional security architecture. They emphasised that the maintenance of peace, stability, freedom, and safety of navigation and overflight in the East Sea not only benefits the involved parties but also the region and beyond. The two sides advocated efforts to accelerate the settlement of any disputes via peaceful means and in line with international law, including the 1982 United Nations Convention on the Law of the Sea (UNCLOS), while strictly implementing the Declaration on the Conduct of Parties in the East Sea (DOC) and soon reaching a Code of Conduct in the East Sea (COC).